I noticed something strange going on with the Baywatch and Emerson apartments some time ago. Have you noticed anyone going in or out of them over the past year? I haven't. Now a notice appears on the Bayview indicating that it's stuck in a lawsuit - the owners are filing Chapter 7 bankruptcy and are trying to hold on to it. Whatever the case, I hope it gets resolved soon. 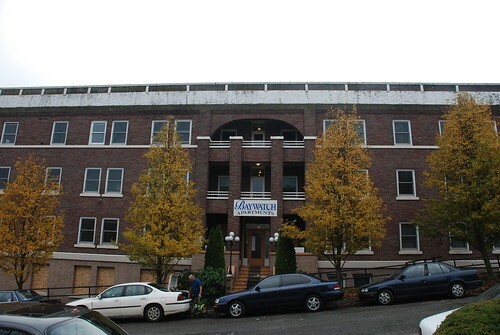 There is a lack of affordable housing and these two buildings account for 74 units of housing - that could help put a lot of eyes and feet back on the street. I still think that DIY condo idea could work - even in these trying times. by Erik on 12/9/2008 @ 8:58pm Great pictures Morgan. However, a bankruptcy has not direct effect on the building being occupied. 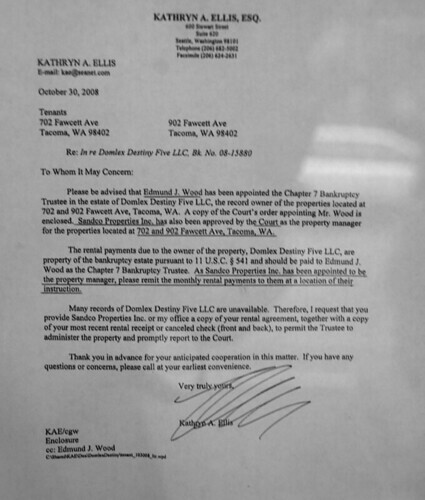 As the notice states, the rents are to be paid to the trustee who will pay the creditors in some form. 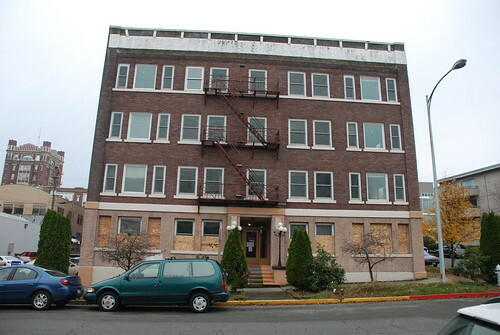 Hopefully, the trustee can get the building under control and rent it out as they have a duty to maximize the assets. In Chapter 7, a debtor surrenders his or her non-exempt property to a bankruptcy trustee who then liquidates the property and distributes the proceeds to the debtor's unsecured creditors. In exchange, the debtor is entitled to a discharge of some debt; however, the debtor will not be granted a discharge if he or she is guilty of certain types of inappropriate behavior (e.g. concealing records relating to financial condition) and certain debts (e.g. spousal and child support, student loans, some taxes) will not be discharged even though the debtor is generally discharged from his or her debt. Many individuals in financial distress own only exempt property (e.g. clothes, household goods, an older car) and will not have to surrender any property to the trustee. The amount of property that a debtor may exempt varies from state to state. Chapter 7 relief is available only once in any eight year period. Generally, the rights of secured creditors to their collateral continues even though their debt is discharged. For example, absent some arrangement by a debtor to surrender a car or "reaffirm" a debt, the creditor with a security interest in the debtor's car may repossess the car even if the debt to the creditor is discharged. 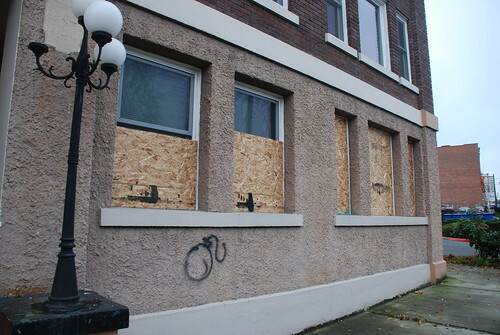 Seeing the first floor boarded up does not look good though. Looks pretty blightfull. by Crenshaw Sepulveda on 12/9/2008 @ 9:10pm I think the first floor is boarded up to prevent vandalism and trespassing. It is very important for this building to be pressed back into service as housing, however. 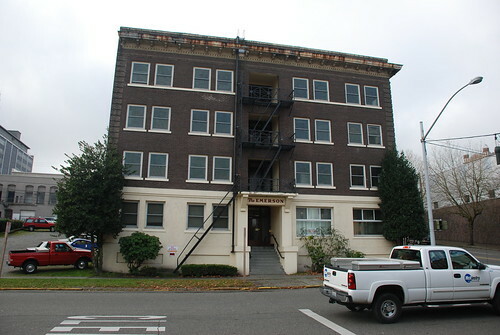 I do hope the bankruptcy judge or trustee moves quickly so that this building doesn't actually turn into a blight. The neighborhood is right on the fringe and what happens to this building will have a great impact on how things go in the general area. This building is just a short block away from the Roberson, a fancy new condo still trying to sell units in a mostly empty building. by Erik on 12/9/2008 @ 9:31pm I do hope the bankruptcy judge or trustee moves quickly so that this building doesn't actually turn into a blight. There is another untold story here as to why the place was vacated in the first place if it is indeed vacant. Filing a bankruptcy doesn't cause anyone to be evicted. If it is vacant, I suspect, the owners were neglectful and let it fall into a state of disrepair. If they are not careful, the building could become a real hazard. by Crenshaw Sepulveda on 12/9/2008 @ 10:19pm I seem to recall that the building was vacated rather abruptly. It was not that long ago that people were living there. You are correct about the bankruptcy filing. There is an interesting story here, vis a vis these properties and I'm hoping we can learn more. I'm not certain that the owners were all that neglectful. I believe the double pane insulated windows were installed just this last year. If you look up the owner of both these properties, Domlex Destiny Five LLC you will find that both these properties are in foreclosure and a trustee's sale has been scheduled. Purchased in 2006 and in foreclosure in 2008.
by morgan on 12/9/2008 @ 11:12pm It seems like the buildings were vacated around the time they were sold. Sometimes buyers can ask sellers to vacate buildings as long as the renters are on month-to-month. This would be what someone might do in the case of a condo conversion. I asked a neighbor of the Baywatch if he knew what was going on and he replied that they came up for auction a month or so ago but were pulled off the list at the last minute. As far as he knew, nobody is living in them. I myself have seen lights on and indications of people living inside. 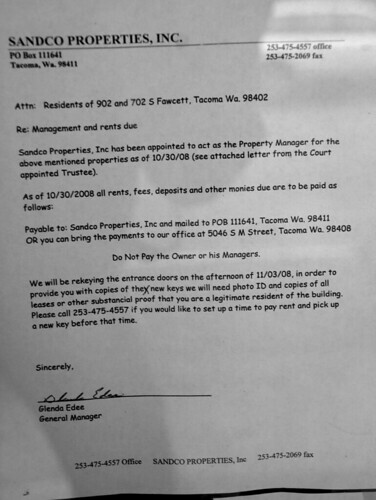 They could be squaters, friends of the owners, or lingering tenants wearing out their lease. 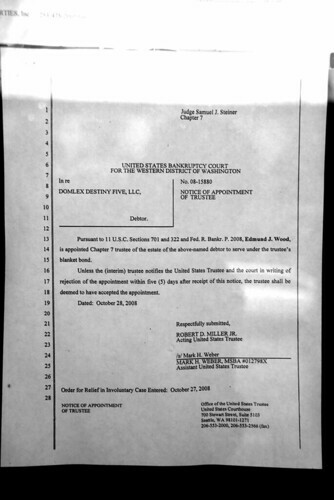 by Crenshaw Sepulveda on 12/9/2008 @ 11:19pm It does appear that this is an "involuntary bankruptcy" which means it was initiated by the creditors for their protection. It also appears that the debtors, Domlex Destiny Five LLC has been hard to reach by the bankruptcy court. I do believe there were people living in the Baywatch this summer, and the sale to Domlex was completed in 2006. From what I recall there was a notice on the door that the power and water was turned off by the utility.